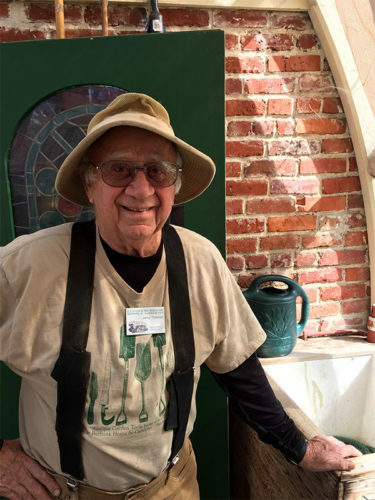 I was happy to have my spirits lifted by our first sunny, rain-free days—preceded by ‘torrential rains!’ I headed out for LBH&G to interview Gardener, Jerry Thoman. Jerry is being honored as our Volunteer Extraordinaire for April. Jerry was born in Stockton; however, his parents moved to Redding in 1948, where he lived until the 1960s. Redding is where he married his wife, Caroline; their first son was born there. He moved his family to Chico, where their second son was born. Jerry had planned to go to CSU (Chico State University), but found it necessary to find work to support his growing family. He worked for a grocery store chain, where he stayed for ten years. Fortunately, he decided to go to college, where he earned his teaching credentials. He became an elementary school teacher for 5th and 6th graders. I say, “Fortunately,” because I could tell that he is a very kind and easy going person; therefore, his young students benefited. He enjoyed a ‘thirty-year’ career. I asked him how he came to volunteer at the Gardens. He told me he was visiting the Gardens in 2011, when he complained to his friend that the signs were crooked and leaves were everywhere. His friend said, “You know how to fix that. Volunteer.” Well, luckily for us, he took a Volunteer form, filled it out and the rest is history. Jerry has two other volunteer pursuits—one is hugely out of the ordinary. Now, all his activities are ACTIVE by nature. (I could tell that Jerry is NOT one to sit around doing crossword puzzles.) As a matter of fact, Nature is his main interest—he volunteers every March for a Dive Club. They take on a huge and I would say dangerous undertaking, as they clean up the ‘jetty’ at Doran Park. They find all varieties of litter. I did not even know about this–did you? I think it is amazing! I guess we do not have enough weeds for him, because his also volunteers for the Windsor Gardens. It is a garden club that rents space for people to grow their own produce. Jerry is also an inventor. He designed (and we use these items at the Gardens), a device that holds heavy trash cans onto the dollies, as they often would fall off and make a huge mess. His device averts that and he designed another tool which easily twists and pulls weeds. Well, Jerry, with all of your energy and ingenuity, we all hope that will be several years away. You are truly a Volunteer Extraordinaire and just keep on moving, as that seems to be what you know best—continuous motion. We need more “Jerry’s” in this world. Please take the time to tell Jerry just how much we appreciate him—NOT just for being here, but for the other responsibilities he engages in. He is making and keeping our environment clean and visually inviting.